Parmigiano-Reggiano - an Italian Masterpiece! Parmigiano-Reggiano is indisputably one of the world's great cheeses. Don't be fooled by all the imitations out there which are labeled Parmesan or Parmigiano. The real stuff must be produced within the provinces of Parma, Reggio-Emilia, Modena, and in certain regions in the provinces of Bologna and Mantua. Its name is protected with the Denominazione di Protetta (DOP) designation. Parmigiano-Reggiano is produced from partially skimmed, raw cow's milk and must be inspected regularly, under the auspices of the Consorzio del Formaggio Parmigiano-Reggiano throughout the aging process, which can range from 1 year up to 4 years. 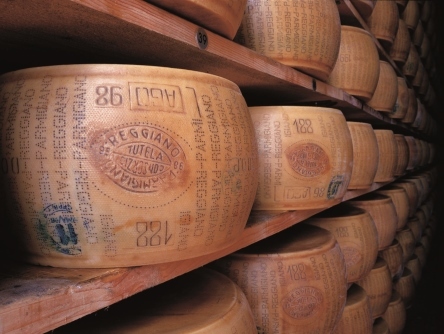 During production the rinds are labeled with the specific number of the maker, the production date and the words Parmigiano-Reggiano all around the circumference of the wheels of cheese, each weighing 53-88 lbs. Later, after one year of aging, the cheeses which pass all quality testing are branded with an oval certification mark. So when you buy the real Parmigiano-Reggiano, you will see at least a portion of the letters on the rind. Even though over two million pounds of cheese are produced each year from over 800 small farms, the quality is never compromised. Not all the producers are small farms producing highest quality artisanal cheese; Parmigiano-Reggiano is also made by dairies and by cheese "factories" - but whatever the producer, all must adhere to D.O.P. regulations. An interesting side-note is that the leftover whey from Parmigiano-Reggiano cheese production is fed to the Parma hogs which eat their way blissfully into their future role as world-renowned Parma Hams. You might want to serve some thinly sliced Prosciutto di Parma along with Parmigiano-Reggiano at your next party! It is thought that the recipe for Parmigiano-Reggiano dates back to the heyday of the Roman Empire, since writings from that period do mention the cheese by name. And we do know that during the Middle Ages, monks were making the cheese using the same techniques which are used today. Parmigiano-Reggiano required large herds of cattle because 600 liters of milk are required to make just one 53-88 lb. wheel of cheese! So it was a natural progression that towns and dairies were built near the monasteries back in the 12 and 13th centuries. Trade began to increase throughout Europe, leading to the development of wonderful cheeses, wines, brandies, meads and champagnes, enjoyed just as much 800 years ago as they are today. What you see today when you gaze upon a cave or cellar filled with wheel after wheel of Parmigiano-Reggiano happily sitting through the aging process ... will be large drums 14-16 inches in diameter and about 8-9 inches tall. 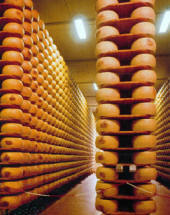 The natural rind is brushed and oiled regularly, and the cheese is turned often. The rind is straw-colored to dark yellow, with the Parmigiano-Reggiano name stencilled on it, along with the logo of the consortium, the year and month of production and the producer's ID number. This is one official-looking cheese! The interior paste will be light ivory to yellow and sometimes you can see little crystals on cheese which has been aged in the proper way. It should have a granular, crumbly texture, but should not be allowed to age to the point where it dries out. The best Parmigiano is produced over the summer and then aged for 2 1/2 to 3 1/2 years. Flavor-wise ... sublime - complex - sweet - an absolute artistic and culinary treasure. Arguably it is ... "Il formaggio migliore del mondo" (the world's greatest cheese). Try a wedge of Parmigiano-Reggiano with thin slices of pears and Parma ham, thick slices of artisanal, peasant-style bread, and walnuts. A Chianti or red Barolo wine are wonderful to pair with it ... or if you are feeling particularly rich and festive, serve some Champagne. Prosecco, a sparkling Italian wine, is a terrific alternative to Champagne as it is much less expensive. Too Cool to not Tell You About This! Yes! You read that right this is a Wall Graphic - removable wall paper that comes in different sizes up to 60x40 inches. How do you say trompe l'oeil in Italian?! Click on the image or the link above to order your primo wall art today! - G.C.D.